We stress the importance of neutering and spaying all rabbits to reduce the ever-growing population of unwanted rabbits and to prevent highly prevalent reproductive cancers in unfixed rabbits. Since our inception in 2007, we have accomplished our mission by saving the lives of almost 2,000 abandoned rabbits. However, the over-abundance of unwanted domestic rabbits keeps us working toward our goals, year after year. Together we can accomplish our mission. Reach out today if you’d like to help! 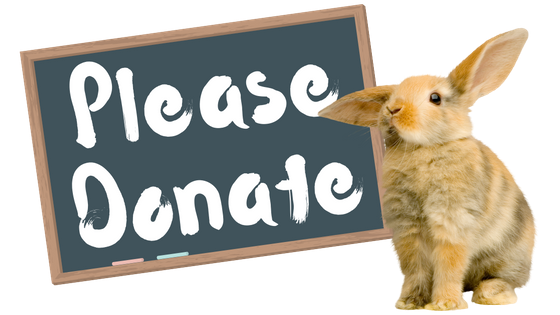 Rescue and placement for abandoned bunnies in the Philadelphia area. We take in rabbits who are no longer wanted, have been abandoned, and/or have been abused. Once cleared by our vet, we have them neutered/spayed and find new, loving homes for each. In addition, we host various events to educate people about rabbits and their needs. Tomorrow is the last chance to register for our May 5th painting party, because our instructor needs enough time to custom make the stencils for your board. See event info in the comments section. Not a rabbit owner, but still want to help out LNB? There will be a monogram wreath option and a Mother's Day option, as well. Maybe you'd even like to bring your mom, daughter, or another family member to create the perfect Mother's Day gift! A portion of the proceeds from all ticket sales will be donated to Luv-N-Bunns and go directly to help our bunns in need. Cost is $35 per person (please note your choice of stencils/phrases along with your RSVP and in the post on the FB event page). Payment accepted via PayPal (to jstampler@yahoo.com) or Venmo (@erin-stampler). Raisin and Freckles (formerly Mocha & Coco) are happy as can be in their forever home! These best buddies love to binky, run around, and do "nose flops" on the blanket. Add in some delicious hay that they think is pretty much the tastiest thing ever, and you have a recipe for complete and total hoppiness! Grab your limited edition Northeast Bunfest 2019 merchandise before the campaign closes. Featuring Dark Heather Grey Premium Unisex Tees, professionally printed in the USA. You know our fantastic intern Katie from her weekly "Bunn on a Budget" comics. Now, please join us in giving her a huge round of "app-paws" for getting into vet school! Katie has been an incredible help to all of us at LNB, and we are so excited for her as she starts the next chapter in her journey to becoming a vet. How lucky her future patients will be! Congratulations, Katie!